Interactive sound installation integrated to the environment. Nine orange megaphone speakers were mounted on the upper part of the 9 pillars at the Prism Room at Henie Onstad Art center, Ad HOK 1995. 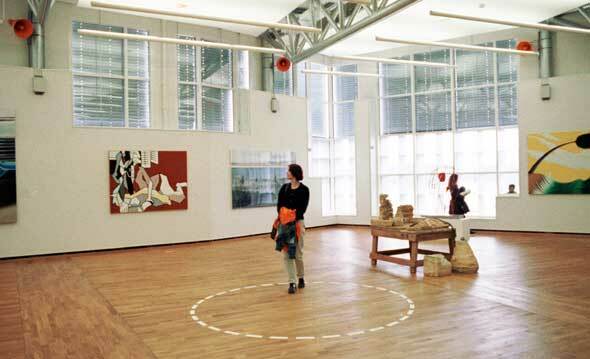 The visitor enters a doted circle on the floor in the center of the room and the sound sculpture is invoked. As long as the visitor is moving within the virtual cylinder, the sound continues and the visitor is enclosed by the mass of the sound of heavy traffic going round. The sound is controlled by an IR-detector connected to 3 control boxes with p.c.-boards. The original sound was a mono recording of heavy traffic. The sound was digitized and feed to a custom software which combined the sound with the outline of an infinite eight symbol. When the visitor leaves the circle the sound stops after 8 seconds. Silence come as a relief. "Traffic Zone" and "Birdmachines" are counterparts.